Modern sports culture knows no boundaries – neither geographically nor in terms of performance or image. It's a lifestyle, where pleasure and profit ambitiously exist side by side. Enormous stadiums are being constructed to host "mega-events" like the Olympic Games in London, to be taken down or moved to a different location afterwards. Anything is possible, but finding the right balance of temporary elements and lasting identity represents a great challenge for planners and architects. Therefore, they look for materials that cater to these developments and allow new opportunities to be exploited in terms of expression and functionality. GKD-USA, the leading full service provider of woven metal fabrics, has history as a global player in the transformation of stadium architecture. As it is strong enough to resist vandalism, easy to care for, maintenance-free and non-combustible, the material meets the fundamental requirements of modern facility management. The large range of mesh types – flexible or rigid, solid or fine – with tailor-made transparency, light and air transmission inspires planners to create ever more daring and bold designs. 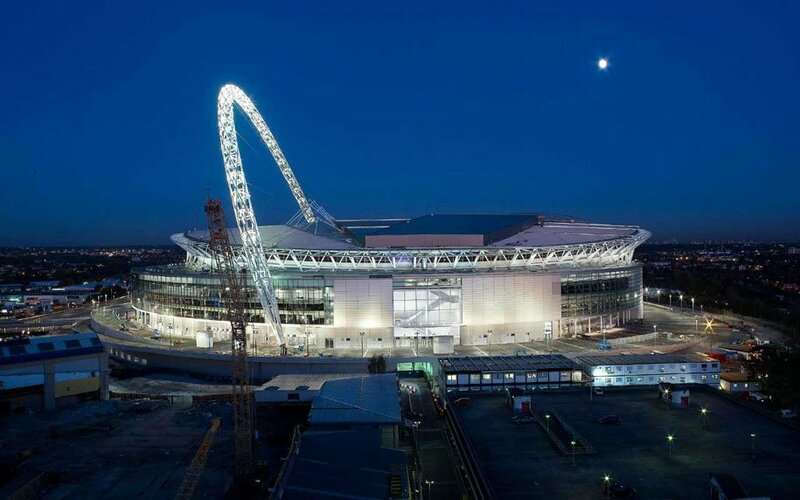 GKD stainless steel mesh can be seen at the legendary Wembley Stadium, which hosted the 2012 Olympic Games in London. Designed by Norman Foster, Wembley is the largest of the six venues hosting the London 2012 Olympic Football tournament. Some 13,000 square feet of GKD Tigris stainless steel mesh partially covers the facade of the stadium, which was opened in 2007. The striking entrance to the Estadio Santiago Bernabéu in Madrid was created using 35,500 square feet of Escale 7x1 spiral mesh. The panels on the stadium facade, angled at 32 degrees, was originally to be used as a projection platform for advertising targeted to soccer fans as they entered the stadium. Although this intention was ultimately not realized, the mesh used in the facade creates a memorable three-dimensional effect due to its reflective characteristics. Yankee Stadium opened in April 2009 and replaces the original 1923 stadium. Approximately 33,000 square feet of the stadium ­­– both interior and exterior surfaces – were clad with GKD stainless steel woven mesh products including Tigris, Tigris PC and Omega 1505 PC. All are made of ASI Type 316 steel and are 100 percent recyclable. Attachment methods differ for these products depending on the fabric’s application, panel size, structural characteristic, scale and the project’s design intent. Selected for ease of maintenance and extended lifetime performance, the material was applied to wall cladding, elevator wall cover panels, handrail and railing infill panels, and stair enclosures. In particular, architects and designers chose Tigris for its unique pinstripe design that is characteristic of the New York Yankees uniforms. GKD also applied its proprietary etching technique to prominently display the famed New York Yankees logo onto panels above elevators. When the NBA’s Miami HEAT Group decided to create a marquee on the exterior of its American Airlines Arena, the franchise wanted something that would not only draw attention to the arena itself, but also transform downtown Miami. Made from 3,400 square feet of a high-grade architectural woven stainless steel mesh fabric with interwoven LED profiles, Miami’s Mediamesh® screen, patented by GKD and ag4, provides visitors to the Arena with unobstructed viewing from the interior and visually engaging digital media content on the exterior. Standing three-stories tall (42 feet high by 80 feet wide), Miami’s Mediamesh façade is four times the size of an average billboard. The arena host more than 1.3 million guests per year for concerts, family and sporting events. The Caja Magica, another arena in Madrid which was constructed within the scope of the bid to host the 2016 Summer Olympics, represents a further milestone of metallic mesh in the construction of multifunctional sports venues. Over an area of 80,000 square metres, it boasts three courts, which offer seating for 12,000, 5,000 and 3,000 spectators respectively. The stadium gets its name from its three-piece roof construction, which can be opened as if by magic converting the indoor arenas into open-air stadiums. The entire complex is seamlessly enclosed in a special version of the "Escale 10.5 x 1.2" stainless steel spiral mesh. The facades of the indoor courts use "Escale 7x1" mesh cladding. Architect Dominique Perrault selected the various spiral mesh sizes to cater for the different viewing distances, working to the principle of: the shorter the distance, the smaller the spirals. The reflective surface of the panels draw attention away from the gigantic construction and employs precisely defined light and air transmission to convey an outdoor feeling to the inside of the stadium. Danish office JDS Architects followed this approach for the now legendary Holmenkollen ski jump facility in Oslo. More than 46,000 square feet of GKD Sambesi Light and PC-Sambesi metal fabric clad the steel frame construction. The semi-transparent membrane shimmers during the day and acts as a wind filter, protecting athletes from dangerous side gusts. At night, the backlit mesh transforms the jump into a brightly lit ramp ascending skyward. The facility now ranks as one of the top winter sports venues and hosted 2011 Nordic World Ski Championships. Woven metal caters to planners and architects all over the world for expressions of dynamism, leading edge technology and quality in modern arenas. The shimmering surface of the metallic mesh draws visual attention away from otherwise hulking structural elements and provides stadiums with a living identity through an interaction with daylight and environmental influences.